One of the first steps to a great outdoor space is to look at Outdoor Lighting Ideas for the Patio to be able to use it even if it is dark outside. We will look at several steps toward meeting your lighting needs. Outlining the area to be lit after dark is the first step. Different areas will need different lighting needs. A outside dinning area will not need a bright light, maybe just some mood lighting and/or some type of table light. The newer solar lights in an Umbrella can work for you if you are in a remote location. A wandering path with a bench or swing will need path lighting and maybe some soft lighting for the sitting area. If in the shade solar lights will not work for the sitting area. A walkway or driveway leading to the front door will need some type of security lighting or path lighting. You will have to look at your area and determine the style of lighting you will need. Make a list of the type of styles of lighting that will work for the area you will be covering. Measuring the total area to be covered will be the next step. If it is a pathway, what is the total length of the lighting that you will need. If it is a parking or sitting area, you will need to determine the square feet of illumination you are looking at. This step will determine the amount of lights needed. When looking at lighting fixtures you will need to take into consideration the area that each fixture will cover. This will vary greatly with the type of bulb and design of the fixture. Floodlights will cover a big area, some solar lights will only cover a few square feet. To get path lighting to cover the whole path, you must have some overlap of the lighting coverage. Spot lights that are used for highlighting a special feature in your outdoor space will have different angles of coverage, depending on the style of the fixture and bulb. some will be better at short distances (a feature on the side of the house) and others will be better at longer range (a flag at the top of a flagpole). The major styles of lighting will be Post light (looks like a small street light with decorative top), Spot light (can be a single or dual bulb fixture to light up a large area), Deck-Step -or Path lights (Smaller lights that work in a group to light a walkway), Brick lights (lights designed to take the place of a brick in a wall), Retaining wall lights(used to highlight the face of your retaining wall). 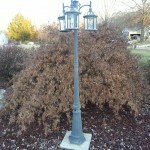 These lights can be purchased in Line voltage, Low voltage or Solar powered. The choice of power will be determined by the layout, amount of light needed and type of power source that is available. The finish of your lights will be to match your decor. Most lights will come in many finishes that will withstand the outdoor weather. The source of your power to your lights will determine the layout of your power lines. Line voltage will require a live 120 volt wire to be run from a ground fault outlet to the fixture. Most of these power runs will be underground and will require you to follow local rules. Low voltage lights will require the use of a transformer plugged into a ground fault outlet and a low voltage wire run from fixture to fixture. I have outlined several steps in this blog. Solar lights only require the use of a photo cell to capture the suns rays to turn it into electric current. This means that the fixture must be in the sunshine for most of the daylight hours. There are some kits that have a remote photo cell, these kits act more like low voltage kits as you have to run a wire from the photo cell to each light fixture. What will be the purpose for lighting, casual sitting, reading, highlighting a feature, eating or just walking without falling over things. 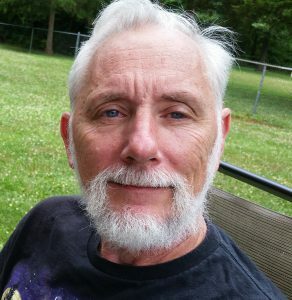 What type of power source will I use and will it require running wires underground. When will I need the light, what kind of control switch will work for me. 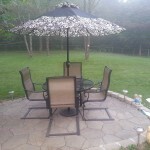 When looking at Outdoor Lighting Ideas for the Patio, several things will need to be taken into consideration. If you do your proper research and make a list of the things that will be most important, you will get the right lights the first time. Hi Chris, Love your site. You have some really good ideas for outdoor lighting. Hoping to implement some of them. Thanks. 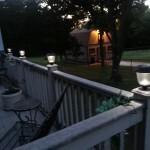 Outdoor lighting will be of great value if you spend time in your outdoor space after dark. They will give you an extension to you home that will cost a lot less than adding a room. This is a great post. Thank you so much for writing it. Lighting is something that I am lacking in my garden at the moment, so your ideas have given me some thing to think about. There are actually more options than I thought there were, and a couple that I didn’t even know about. Very useful – thank you again. As this site grows, we will cover these lighting ideas in more detail. There are so many options in outdoor lighting that I will write about in the future. I like solar powered lights especially as installation is simple. The downside is that you can’t switch them on and off at will and you may not have them when you need them. I have some solar lights in one or two areas for aesthetic purposes only, but I also use them in some areas where you need adequate lighting. I have additional lights in place here that I leave switched off unless needed. It’s extra work, but the standby lights are nothing fancy (as they are usually off) and therefore, don’t cost a lot. Having more than one style or type of lighting in your outdoor space is sometimes necessary because of the daylight. Most solar lights do not have any off and on button, only dusk to dawn.